Roman Steps | Gwrach Ynys, Snowdonia Bed & Breakfast, (B & B), Accommodation near Harlech North Wales. A few miles down the road we have two of the most beautiful valleys in Wales. Cwm Bychan and its parallel sister valley Cwm Nantcol. The road leading to these valleys turns off the A496 in Llanbedr, and gives easy access to the high mountains. 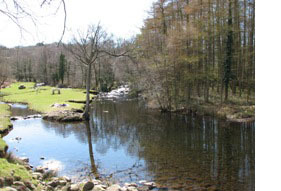 At the head of the narrow wooded valley, Cwm Bychan, lies a lovely brooding lake under the cliffs of Carreg y Saeth (The Stone of the Arrow). Beyond the lake there is parking in a field at the start of the path leading to the Roman Steps. Though not Roman, the series of stone steps were constructed in medieval times as a pack animal access over the hostile terrain from the hinterland onto the coastal plain. 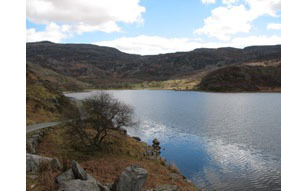 From the main path one can digress by much fainter tracks onto the mountain to visit Llyn Morwynion ( Lake of the Maidens ) or Llyn Du ( Black Lake ) or even progress to the summit of Rhinog Fawr. But take care if the mist is down, the terrain is one of the most notorious in Britain for finding your way if you get lost. Cwm Nantcol is a much broader open valley with the heather cloaked slopes of the Rhinog Mountains standing sentinel at its head. It is especially lovely in the spring when the newborn lambs are everywhere along the roadside. Several paths lead off into the hills, the most spectacular being the Bwlch Drws Ardudwy ( The door into Ardudwy), which is the pronounced gap between the two Rhinog. Five minutes into the valley you will find a farm trail, waterfall gorge, with plenty of parking and camping spaces. If a swim in a mountain stream and a nature walk is your idea of a perfect day,look no further.